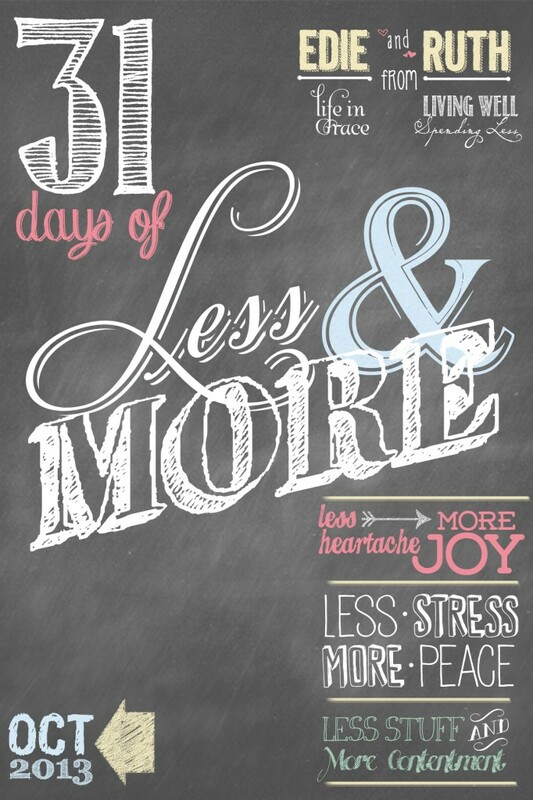 Welcome to 31 Days of Less & More! Edie and I are so excited to share this series with you, and we truly hope and pray this will be an amazing, life-changing month for you…and us! We will be encouraging lots of support and discussion on our Facebook pages, so be sure to “like” both Living Well Spending Less and Life in Grace on Facebook if you don’t already! This is the overview page where you will be able to find all the links to each day’s posts. All of the “Less” posts are found here on Living Well Spending Less, while all of the “More” posts can be found over at Life in Grace. Be sure to bookmark this page so that you can easily find a post or a challenge!